We work as a liaison for clients, architects and custom builders guiding the overall aesthetic of the house from beginning concepts through completion. Whether starting from ground up or reimagining your current space, we work with your team to select materials, design architectural details and customize the home for your individual needs. Susan will work with you on the design project of your choosing. Ask questions, select paint colors, guide furnishing selections and suggested furniture layout. You benefit from Susan’s personal attention & expertise. After the consultation is complete, you will receive a summary of recommendations to bring the design to life as your budget allows. One of the most impactful services we provide to our clients and one of favorites – is that of styling rooms. 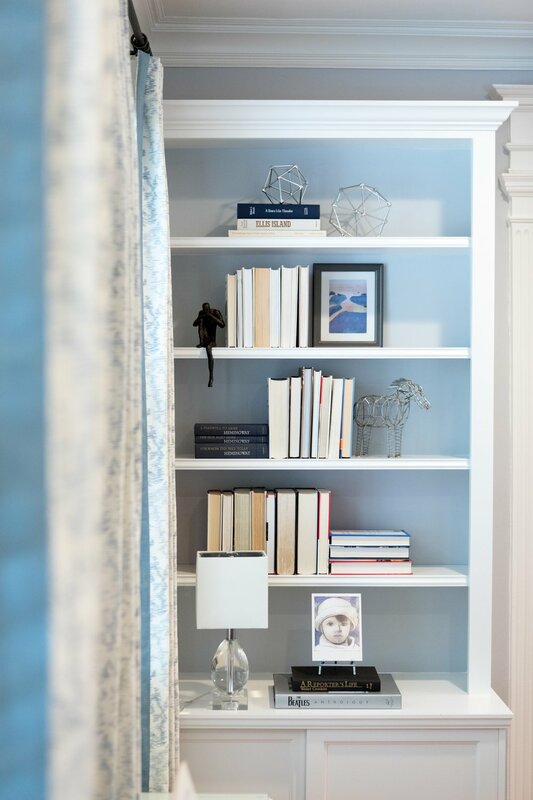 We curate accessories, personal mementoes, and decorative objects – whether newly acquired or found throughout your home – we artfully layer in the design details to complete your room. First and foremost we love to solve our clients design challenges and we do so in a very thoughtful, detailed and stress-free manner. We also like to have it a little fun along the way! To present our clients with an exceptional renovation or design experience, we come to the table with our focused attention to guide you through the process from start to finish. Catering to busy professionals, we serve our clients during every stage of their projects - from conception to implementation and beyond. Our mission is focused on delivering personalized living environments that our clients are proud to call home. At SCR INTERIORS, we are supported by a system for managing deadlines and expectations to make the design, renovation and/or construction process more joyful and less stressful. The process begins with a conversation. We need to get to know you, what you love and don't love about your space, and what inspires you. Using the design concept, we source and order furniture, fabric, window treatments, light fixtures and accessories. Finally, the design concept becomes a reality on installation day, and you begin enjoying a space that is truly you. FEATURING OUR LATEST PROJECTS, DESIGN INSPIRATION AND MORE! Providing professional interior design services in the Washington D.C. Metro area including full service residential design and decor for home interiors.